Customized Olive Leaf Drying oven For Drying Leaves is applied to drying, ripening and sterilization of black Cereals, soybeans, mung beans, corn, wheat skin, buckwheat, oatmeal, soybeans and peanuts.Drying sterilization seafood seasoning, sterilization, drying, puffing Tenebrio; rose, tea and other tea flower.Conventional thermo - thermal sterilization starts from the surface of the material, but there is an internal and external temperature difference through the heat conduction to the interior. In order to maintain the food flavor, shorten the processing time. Microwave refers to the electromagnetic waves frequency between 300MHz-300GHz, wavelength is between 1mm to 1m. Microwave usually shows penetration, reflection and absorption characteristics. For glass, plastic and porcelain, microwave will penetrate it without being absorbed. For water and food, it will absorb microwave and heating itself. For metal material, it will reflect the microwave. Water molecule is polar molecule, it will change its polarity and friction motion cause by the effect of high speed change of high frequency electromagnetic field. Then the microwave electromagnetic field enerLD can be converted into heat enerLD, and achieve the purpose of drying. Microwave uniform heat up the material inside and outside because of the strong penetrability, will not appear outside dry but inside wet. Body heat source state formation shortens the time of heat conduction and save a lot of drying time. 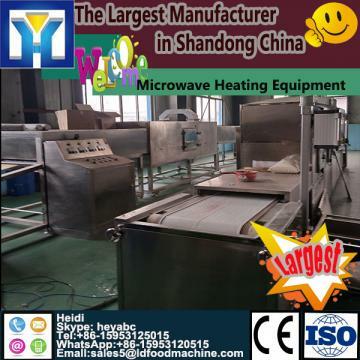 Microwave sterilization temperature is from 70°C to 105°C, period is from 90 to 180 seconds. Microwave thermal effects change the bacterial protein, make it lose nutrition, reproduction and survival conditions and death. Microwave electromagnetic field can make normal growth and stability of the genetic breeding of bacteria nucleic acid [RNA] and deoxyribonucleic acid [DNA] number of hydrogen bonds slack, breakage and recombination, thereby inducing genetic mutations, chromosomal aberrations and even rupture.